Witches’ fingers are another standard item on our annual Halloween supper – along with the pumpkin soup with coconut milk, roasted pumpkin seeds and bloodsucking jellies. I always steam a big heap of green beans to provide a nod in the direction of healthy eating (though I expect Adam and I end up eating most of them). The original recipe is from Delicious magazine. Cut the chicken breasts into thin strips, and toss with the ketchup. Tip the crushed crisps onto a shallow plate. 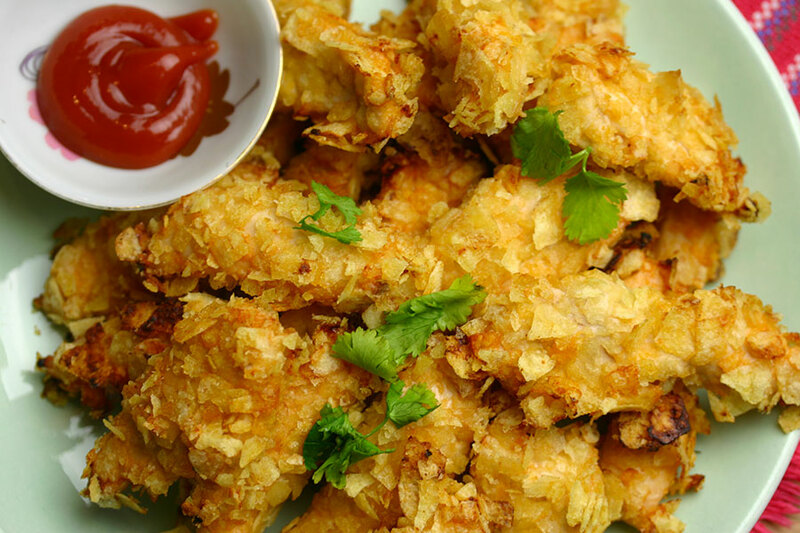 Roll each chicken strip in crisps to coat, then arrange on baking sheets lined with baking parchment. Cook for about 15 minutes, or until cooked through. Serve with extra ketchup for dipping. Too gud. What can I substitute to crisps. Will oat flakes or cornflakes work?? I’d try cornflakes over oatflakes, or maybe crushed crackers?